Idelle Packer, M.S., P.T., C.T.A.T. 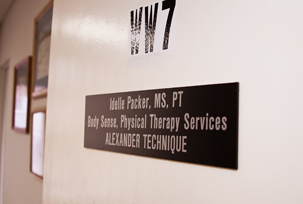 Body Sense, incorporated in the State of North Carolina, is an integrative physical therapy practice. As founder and director of this unique practice, I utilize the Alexander Technique in the assessment and treatment of people with posture and movement dysfunction. The educational model of the Alexander Technique works well in physical therapy, as most physical therapists consider themselves teachers. Patient education is also an essential component of Complex Decongestive Physiotherapy, the program in physical therapy for the condition, lymphedema. I have completed the advanced certification in breast cancer related upper extremity lymphedema with Linda T. Miller and a third course in upper and lower extremity lymphedema management with Elizabeth Augustine, MS, PT. To become independent in self-management of lymphedema requires an understanding of the condition and learning how to use exercise, breathing, self-massage and compression to reduce the affected limb and keep it healthy. At Columbia University where I received my physical therapy training, courses in pedagogy stressed the importance of patient education and the essential component of any treatment plan: what you take home with you in knowledge about your body, home exercise, and the ability to self-manage all aspects of your life. As sole practitioner of Body Sense, I offer treatment programs for a wide variety of patient needs: Complete Decongestive Physiotherapy for people with Lymphedema, physical therapy and the Alexander Technique for people with conditions as varied as headaches, TMJ, asthma, neck, shoulder, back and hip pain, dystonia, arthritis, osteoporosis, balance disorders, Parkinson's Disease, multiple sclerosis, and lymphedema medical rehabilitation, back care. I incorporate the Alexander Technique and breathing coordination training when teaching back care, body mechanics, therapeutic exercise, or any other physical therapy modality. Body Sense also offers a "wellness program" for people who wish to learn more about their body, about how to improve fitness and health, how to apply the Alexander Technique to Yoga, Tai Chi, strength training, running, using a computer, singing and instrumental music, and more daily living. The goals: to acquire skills and knowledge to help you recover from injury/illness, and reach your potential for movement, comfort and expression in all that you do. as any ever discovered in the domain of external nature." "Often it's not apathy but lack of knowledge among health care professionals that leaves lymphedema untreated."